Two days ago we launched Lines, a mobile website that serves up WDW wait times for every attraction in all four parks. Today we’re announcing support for Android phones and two Palm smartphones: the Pre and the Pixi. OK, so it looked pretty darn good on these phones two days ago, but now we’re ready to officially support them going forward. 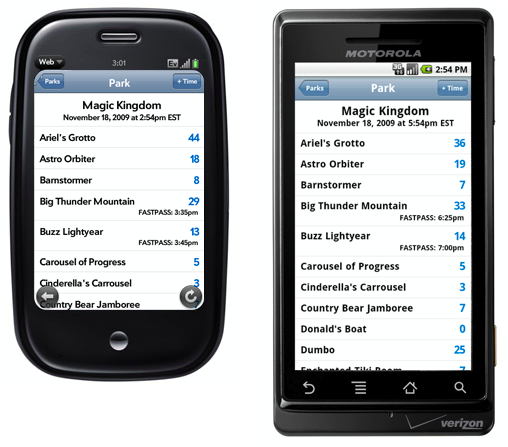 If you’ve got an iPhone, Android, Palm Pre or Palm Pixi phone and want to check out current (and future) estimates of the wait times for attractions like Toy Story Mania!, Soarin’, and the newly opened Space Mountain, go visit http://m.touringplans.com. And if you’re at home and don’t own one of these devices, you can check out the site via Safari. Stay tuned: other mobile phones are on the way! UPDATE:: We now support BlackBerry, too! UPDATE x2:: Lines has graduated Beta and is now a fully featured member of the TouringPlans.com product suite! Read more here. Hey Jackie, we hear ya! Working on it as we speak. Which BB phone do you have? I have a 8130 BB. Going in January is possible. I have the BB tour 9630 from Verizon. Any chance that will be ready by 12/16/09? Thanks, what a great travelers aid you have. Hey Rick, we’ll see what we can do! Henry, will it only be available through the website or will there be an actual app that is offered? In the long term, we’d like to support native apps for the most popular platforms. But we’re pretty much focused on making it available as web apps for now. Will Lines have wait times for the 2 Disneyland parks in the future? We’re definitely planning on Disneyland in the future, but I cannot give you a definite timeline. If you’re traveling soon and would like to help us with data collection, ping me at henry@touringplans.com. Hi, This looks great. When can I get this on my Lg Dare???? Can’t give you a date, sorry! But thanks for the interest. We’ll definitely try to support as many phone types as we can. BB 8350i (Nextel) if you are looking for models to support… 😉 Keep up the awesome work! You say in the intro here that the site can give future estimates of wait times. I am browsing the site in Safari on my Mac and don’t see that option. Even if I use the Develop menu to change my user agent to iPhone, I can’t find it. Does this only work once the park opens for the day? So to see future estimates, you can click on a specific attraction (say, Splash Mountain). Further down on the page we’ll tell you the expected wait time 30,60,90 minutes away, as well as when FASTPASS will be gone, and when the peak wait time will be. Look for more of this type of data to come. It seems you can only view this data once the park is open. It would be great if you had a date picker for future wait times. Obviously, these wouldn’t be as accurate as the real-time data once user participation reaches critical mass, but it would be a neat planning feature. If you feel the data is not solid enough for an open-ended search, it would be nice to at least pop open the site from my hotel balcony to see what I am in for that same day. Thanks for listening to my gripes. Part of my job entails software QA, so it’s hard to not nitpick. Thanks for the suggestions!! Really appreciate it. Wait times for arbitrary future dates would be very cool… hmm, but they may not live best on a mobile device (maybe 7 days out on mobile). I’ll think about how we can do something like this in the future. Blackberry Storm? Will that be available soon? Leaving for WDW in three weeks! Hey Robert, we’ll see what we can do! Thanks so much for the interest! Thanks, Henry. You guys are the best! Hey Robert, just want to make sure you know that we’re now supporting BlackBerry! http://blog.touringplans.com/2009/12/04/disney-world-blackberry/ Hope you get a chance to check it out! We leave in 3 weeks. Any chance it will be ready for Blackberry 8330 (verizon)? Hey Mike! Thanks for the interest! We’ll try our best! Hi Henry! Yes, Blackberry, please! I have a Curve, an 8330, I think, on Verizon. Hey Jennifer! Thanks for the phone suggestion. We’ll see what we can do. Thanks for adding Sprint phones! No problem Kim, which Android are you using? Thanks for the comment, Betsy! Not sure if wel’l get it done by Tuesday, but we’ll be working hard on it. Used it on my daughters iTouch last night. Very cool and a lot of fun! Excellent. Yeah, I’m hoping we can support an offline version of the Touch in the future. Nice! Thanks for the shoutout, Gina! If you can help spread the word, that would be fantastic! Pretty cool on my Droid. Very nice as is. Would be nice if Parade and Fireworks times were listed with the park hours. Thanks for the kind words! Good idea with the parades and fireworks times, we could definitely do that. I’ll try to see if I can sneak that in the future. Feel free to help spread the word if you have the chance to! Hi. I have never posted to this site (but have lurked for a while), and I just wanted to let you know two things. 1) This is an incredible idea with tons of potential. Thanks so much for developing this. 2) While I know it isn’t supported (yet? ), there is a way to get this working on a WinMo phone right now by using the Iris browser. For anyone needing the program, Google “iris 1.1.9 rapidshare” (the official download no longer exists). Ahh, very cool, Dave! Thanks for the kind words and hat tip. Stay tuned for WinMo! Question – are the wait times given based on predictions only or is it actual wait times? For example, is there info being relayed in “real time” to make the estimate more accurate? Hey Todd, basically we convert mountains of posted times that we’ve collected, as well as actual times we’ve collected in the past, and use both to estimate what we think is the “actual” time you’ll wait in line. And we’re starting to use the data fed in from users a lot more to update our estimates on the fly. Getting this right is part of the reason we’re having a “Preview” version right now. When sorting by land, if you view the details for an attraction, the nav button remains <Park, not <Land. So, when I click the <Park button, I need to again select the land I was viewing to check the times at the other attractions in that land. Hey Rich, that’s definitely a quirk of the system right now. I’ll see what I can do to smooth that out. Thanks! Seems like there’s a problem in the data… As of 2:20 PM on 11/21, Toy Story Mania is showing a 0 minute wait with 0 minute forecasts. Hey Eric, while TSM has had really short lines recently in the afternoon, I would say that this is a bug. Darn beta version! Going over this now. Thanks for the find. People sent in pictures of the posted time being 5 this week! Also, looks like wait times for Future World are becoming unavailable at 7pm, even for attractions (like Soarin) that stay open till 9. Ah, good catch. The future world / world showcase thing gives me lots of problems! Hey Eric, do you know of any schedule for which attraction stay open? Ping me at henry@touringplans.com, would love to pick your brain. This app didn’t work on my old phone, but after an unfortunate stroller accident last week, I now need a new one. I have Verizon and it appears that it works on the Motorola Droid? Do you know if there are any others? I’d love to use this in December. Hey Chris–sorry to hear about your phone! Lines work great with Droid! Hope you get a chance to check it out soon. It works really well with the Droid. Super fast and very easy to use. Let me know if I can do anything to help–I’ll be in WDW in two weeks. I’ll definitely submit times. Thanks so much, Christina! Looking forward to having you test it out. Just got a Droid through Verizon and have looked at the site. Very promising for our upcoming trip (January). One question, how do I get to look at the future wait times? I am interested in knowing what to expect then and make plans accoringly. Thanks! So we currently estimate 30,60,90 minutes out for each attraction, as well as estimating the peak wait time for the day as well as when we predict FASTPASSes will be gone for the day. Just click on an attraction and it’ll take you through. Thanks! Can’t wait to try it out next month. Woot! Appreciate the comment–please let us know what you think! Wow, this is looking like an awesome program! I’m using a Touch Pro, running WM6 (and Pocket IE). If you need any help beta testing it for Windows Mobile, I’d be happy to help! Hey Ryan–thanks! We’ll definitely announce when we’re supporting Pocket IE. Henry, Fred and I will be in Orlando from the 10th through the 14th. Drop Henry an email and see if we can all say hey. is it available for NOKIA N 97???????? Not available currently, can’t promise anything obviously, but we’ll see what we can do. Thanks! Hey guys, it looks awesome and works great on my iPhone. I would love to see an app for the touring plans that gives you step by step instructions. Start by selecting your park and type of plan and then it gives you each step. It could have options like “If wait longer than 30 min, get FP and press here.” It would then take you too the next step on another page. Just a thought. That would be soooo much nicer than printing out the paper before my trip. Yeah, we’re really excited about the possibilities of mobile touring plans going forward. Stay tuned! Hi! Browsed through it using Safari on my iMac and it looks great. Is there any chance it might be working on a Nokia smartphone by January? I am thinking of getting the N96 or the E52 at tha moment and would love to be able to use it on my next visit to WDW. Can’t promise anything w/ Nokia, but we’ll definitely consider it and let you know as to our progress. Hey Len and Henry, I’ll be in WDW Dec. 11-20 with a BB Storm and would be glad to be of any assistance to you. Thank you and I hope we can meet somewhere. Thanks. At 8pm 11/25 Rock ‘N’ Roller Coaster is showing a bunch of zeros, with Fastpass gone. Could this be a similar issue to what Toy Story Mania saw earlier? Yeah–thanks for bearing with us. Need to fix some of the models for RnR. In general, we think we’re doing quite well for MK, and need some more work to get the other parks rock solid going forward. Tried using it this morning, thanksgiving, between 10 and 11 and it did not seem to be working properly. Did demand overwhelm the servers? We had a hiccup that morning–sorry! Was up and running by 11am. Simple, annoying bug–nothing got overwhelmed! But we were however blown away by the usage and data from the parks! We’ll be in the parks next week and I generally keep a written pocket journal of posted/actual wait times while we’re touring. I have an LG enV3. If its useful to you, is there any way I can email/text that data/info to you using my phone, or access a website to facilitate? Would love to get the data via email or whatever is easiest for you. Will be in Disney next weekend 12/6. I have a BB Bold 9700. Any chance to have the Blackberry version ready by then? If it is just a website, I am not sure why it would not work. Can you just allow Blackberries to view the “actual” LINES application instead of just the landing page? We’re planning on offering blackberry support _very_ soon. Unfortunately, we do have to do some decent modifications to get it to even display properly in blackberry! Hey David, BB support is up! http://blog.touringplans.com/2009/12/04/disney-world-blackberry/ Thanks for your patience! Just a note to say thanks for “Lines”. I used it on our my iPhone for our recent 10 day trip. It was very helpful! Im leaving for disney tonight. How do I get this on my Driod? Or do I just go to touringplans.com. Thanks. Looking forward to using this. Just sign up for an account (free is fine for the time being) at touringplans.com, then login in at m.touringplans.com! Just a plug for Windows Mobile phone support (specifically the HTC Touch Pro). Any idea when or if this might be a possibility? Hey Tami, should be working fine if you use the Skyfire browser! Going to WDW next week and looking for a way to access my custom itinerary to my iPhone, link with menus/restaurants and wait times would be awesome! Does Lines do this, or just wait times? Thanks! Hey Kathy! Hope you had a great trip! Currently, still just wait times. Thanks! My daughter asked me if your app works on my Droid? So I came to your site and am pleased to see that it does. We are headed to Disney World at the end of February and are wondering if we need one or three subscriptions? Mom has a Blackberry. I have a Droid. And we have two iTouches. If we get one subscription, can we access it jointly, simultaneously on each of these devices. Our goal is to be sure we all have the same data when we are separated in the Parks. You should be able to access via IE now. Let me know if you’re still having trouble. Very frustrated. I had an iphone. This app worked well, but ATT coverage is terrible where I live. I have been waiting patiently for an equivalent winmo application or atleast similar results with the mobile web site. But still not luck. Why do the off systems (apple) get the good stuff before the systems we all use? Because that’s what we use, I guess! Sorry, die-hard iPhone user here. Anyways, try out Skyfire on WinMo–should look good! Looks like a great tool. I have been searching for this for years. I work for Sprint and this looks great on my Samsung Moment Android. One question, I see Actual standby time and posted standby time. Is “posted” what the ride sign shows and “actual” based on user entries? Love the FP integration. Great value compared to the VZ app! More stuff for less $$ is always good. Hey Brian, we’ve made it more clear now–go check it out!